Following the recent nominations for Local Council elections in May 2019, we have been informed that 11 of the 13 seats have been filled. As there are less candidates than seats, the Parish Councillors will automatically be elected. The new council will run from 7 May 2019. The Parish Council is also a statutory consultee for all planning applications in the parish. We also run various events such as the Fireworks, Picnic on the Green and Remembrance Day for the benefit of Pembury residents. 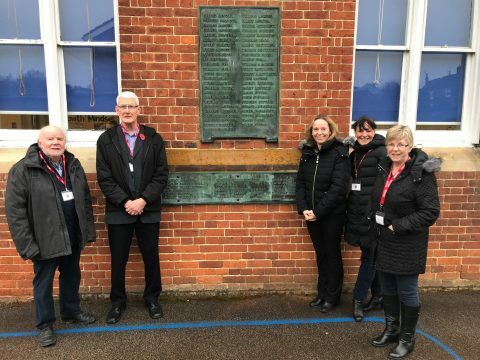 The Parish Council were pleased to attend a recent assembly at the Primary School to unveil the old War Memorial plaques which have been fixed to the outside of the old school building. 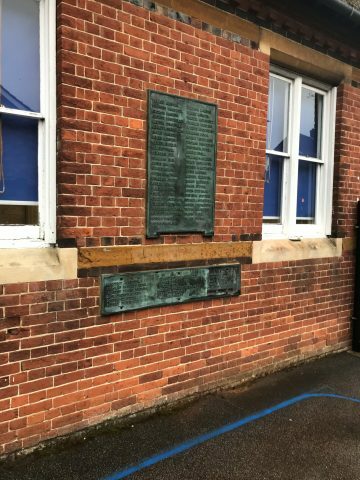 The plaques are still visible to everyone from the footpath by the side of the school down to Lower Green Cemetery. 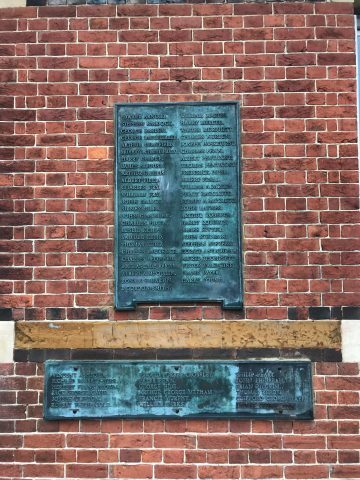 The metal plaques on the War Memorial were replaced with new stone ones with corrected spellings in November 2018 as part of the commemoration of the centenary of the end of the First World War. 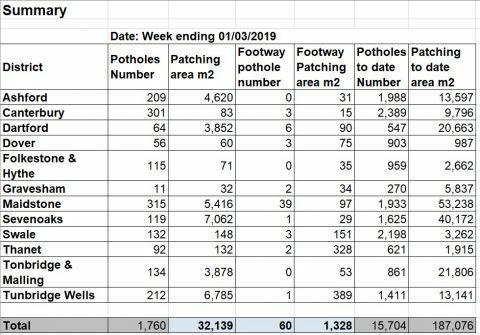 The latest report below shows how many pothole repairs have been actioned this week by Kent County Council, and how many, as a running total for each District or Borough since 1 March this year. 1 April New contractor, URBASER, will take over the waste collection service but there will be no changes to the service until the end of September. 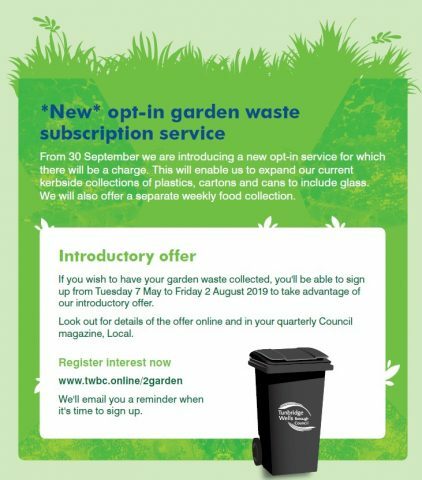 7 May Registration to opt into the garden waste service opens. 2 August Garden waste registration closes. September New food waste containers delivered, plus new black bins for the opt in garden waste. 27 September Old garden waste collections finish. The fortnightly amenity vehicle will no longer accept garden waste. 30 September New collection service starts. 11 November Garden waste registration reopens at £52 per bin per annum. Look out for the introductory leaflet about the new service which will be coming through your door in early March. There will also be more information on the new service in the spring issue of Local magazine , which will be distributed to residents from 11 March. KCC have informed us that it will be necessary to close Dundale Road, Lamberhurst from 18 February 2019 for up to 3 Days. The road will be closed between the junctions of A21 Kipping’s Cross and River Teise bridge. The alternative route is via Alternative route via A21 Pembury By-Pass, A264 Pembury Road, Bayhall Road, Forest Road, Bayham Road, Hawkenbury Road and Dundale Road. This is to enable Urgent Carriageway patching, to be carried out by Kent County Council. 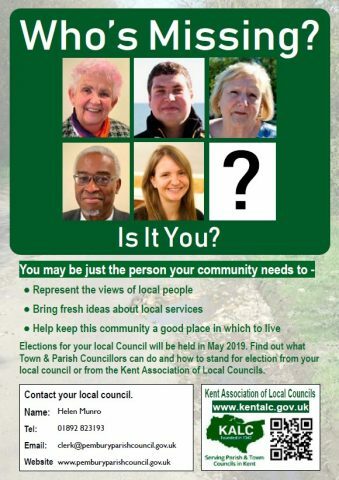 Are you interested in joining the Parish Council? Making a difference to your village? As a councillor representing your community you will help keep it a great place to live and work! You will supported in your role and training is available. Please give the Parish Office a call on 01892-823193 to find out about what we do and how you can help if you are interested in becoming a Parish Councillor at the next election on 2 May 2019. Nomination forms are now available from Tunbridge Wells Borough Council office. The deadline to submit completed forms to the Town Hall is 4pm on Wednesday 3 April 2019. Further details can be found on our website on the Local Council Elections page. Work is ongoing to mobilise the new contract with Urbaser from 30 March 2019 with the current collection service continuing “As Is”. Preparations are also being made to introduce the new recycling collection service arrangements from 30 September 2019. 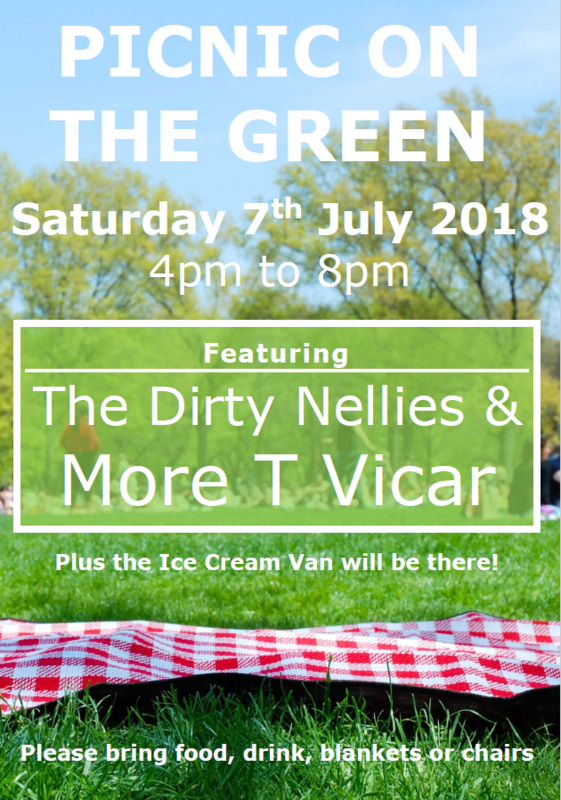 Part of the preparations include an introductory, money-off promotion for the new garden waste collection service. TWBC will be offering residents £10 off their first year’s payment for the service if they sign up online between 7 May and 2 August 2019. Encouraging people to sign up early in this way will give a clearer idea of who will be using the service and enable Urbaser, the new contractor, to plan collection rounds. Importantly for residents, by signing up early they will also benefit from no break in their garden waste collection. Residents can already pre-register their interest online with the assurance that TWBC will contact them when it is time to sign up for the new service and benefit from the introductory offer. The opt-in fortnightly collection of garden waste will be rolled out across the borough from 30 September when the existing mixed, compostable garden and food collection will be phased out. Click here to see a leaflet from the contractor selected to run the service, Urbaser, that will be delivered to all households towards the end of February. The leaflet introduces Urbaser and gives residents early information about what the change of contractor may mean for them. We will of course be following this up with further communications and much more information as we let people know about the roll-out of the new services. Cash machine crime is rare, but there are simple steps that all cardholders can take to help prevent this. Stand close to the terminal. Shield the keypad to avoid anything or anyone seeing you enter your PIN. Stay alert and put your personal safety first. If someone is crowding or watching you, cancel the transaction. Do not accept help from seemingly well-meaning strangers and never allow yourself to be distracted. Have your card company’s 24-hour contact number stored in your mobile phone. If your card is retained, stay at the ATM and contact your bank immediately. If you spot anything unusual about the machine, or there are signs of tampering, do not use it. If you think you have been a victim of fraud, you should contact your bank immediately. 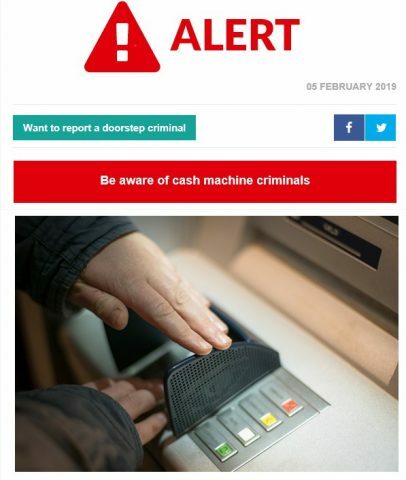 Stick with ATM’s you trust and keep your eyes peeled. If something doesn’t feel right about an ATM or a credit card reader, don’t use it. Warn vulnerable family members, friends and neighbours. 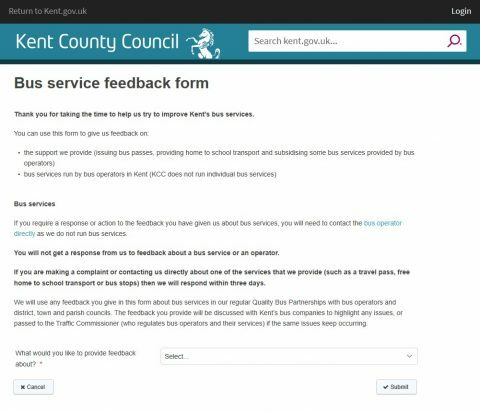 KCC have introduced their new bus feedback reporting tool following comments made during last summer’s Big Conversation with residents. The Feedback Portal includes information about how to make a formal complaint or compliment about bus services and who to contact in the event that bus users experience problems. It also includes a feedback form for residents to let us know about their experiences of using buses and the quality of service provided. Please use click here for the link to the portal.